Lesson – Hitchhiking is dangerous, and business is cruel. Australiaaaaa. I love you. I love you and your fantastic horror scene. I get so weirdly excited when the opening credits start and an Australian production company scrolls across. 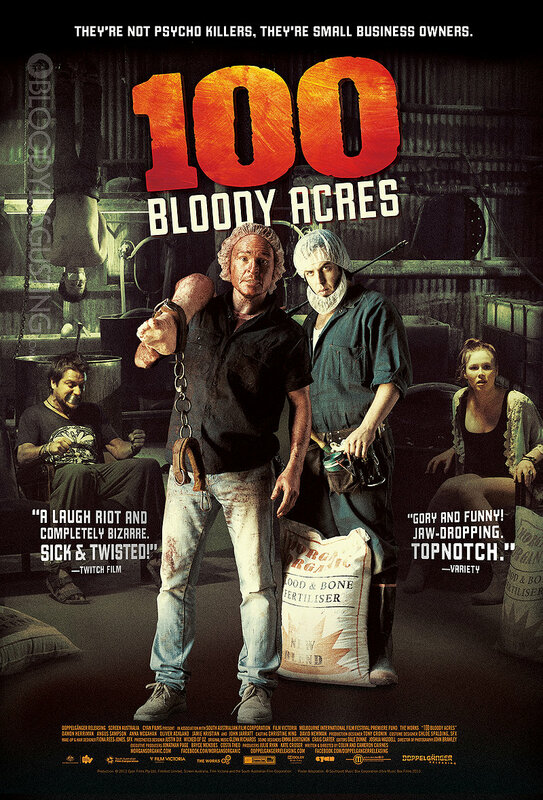 I had no idea that 100 Bloody Acres was Australian by the description, so instead it was a pleasant surprise. 100 Bloody Acres manages to create a unique atmosphere by capturing a Australian folk twang with the cheeky credits song, “I Can’t Even Do Wrong Right“, hand-scrawled signs and “We’ll Fertilize Ya!” painted all cheery-like on the side of Morgan’s Fertilizing truck. Reggie Morgan, played by Australian Hugh Dancy, is one of two Morgan brothers who runs a fertilizing and composting business. There’s one catch, which is that chemically speaking, they tend to add in human remains to the compost blend. They do that by liberating corpses from violent accidents before the police arrive, and our film opens with Reggie liberating a roadie on his way to a music festival. A trio of tourists on their way to the same festival has broken down and needs a ride, to which Reggie reluctantly agrees. He immediately gets the bright idea to kidnap said tourists and use them for fertilizer. Lead tourist lady Sophie manages to charm him with her breasts country-music knowledge, and he consciously decides not to murder them just in time for the two boys to find the roadie corpse. I knew that 100 Bloody Acres would be a horror comedy going in, and while it is a comedy of errors a la Tucker & Dale Vs. Evil, unfortunately the execution is not -quite- there. Tucker & Dale succeeded with having two characters who weren’t evil and are plagued by a bunch of malicious teenage ignorants. 100 Bloody Acres has a very mixed dynamic with an evil character (Lindsay Morgan), a hapless minion growing a spine (Reggie Morgan), the love-interest (Sophie) and the two lackeys without a cause (Friend 1, Friend 2). While very funny at times, it had a tendency to feel a little unfocused. This resulted in some missed opportunities throughout. Early on we are treated to the ‘scare’ factor, which is a large combine for grinding up the bodies. It becomes clear that there is some shaky science that supports putting bodies in live, so our three tourists are allowed to be terrified of being put into the combine alive. It’s much scarier, but they don’t take a lot of advantage of it. The latter half of the movie has some great moments, but is the epitome of frazzled. A lot goes down and it gets sorta random. Frankly, despite some fantastic practical effects and some genuine humor, the conclusion is a departure from the honest comedy of the first half. There is some great gore throughout, I will say. One of my favorite moments features a deep arm cut and Lindsay’s reactions to it. 100 Bloody Acres is a fun time, and if you enjoy horror comedies you’ll probably like it, despite some of the shortcomings in the second half.